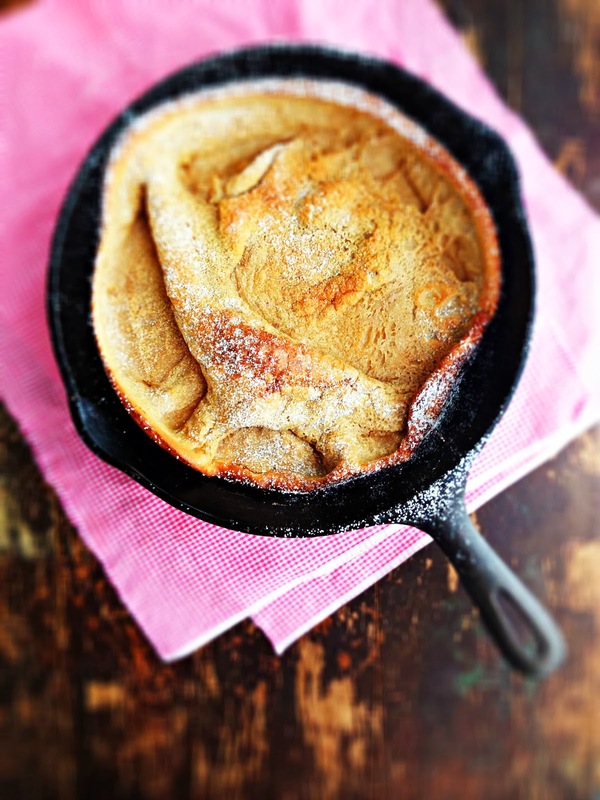 I tasted my first Dutch baby at a breakfast potluck years ago (the world needs more breakfast potlucks, don't you think?) and fell in love. 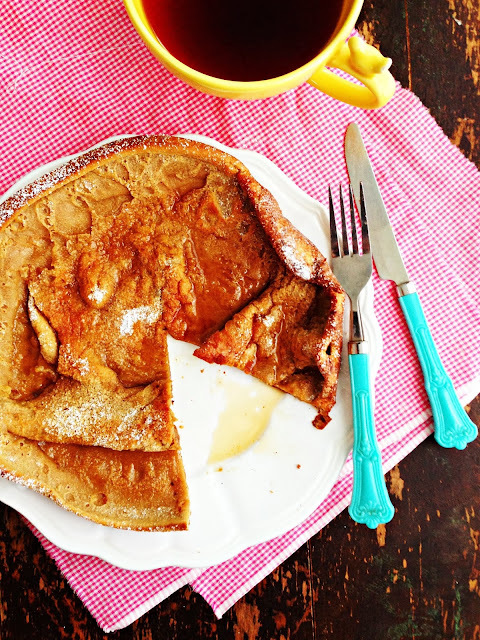 More of a thick crêpe than a pancake, it falls somewhere between the two, but easier to make and more interesting to eat. The batter (I guarantee you have all ingredients in your kitchen) is prepared in a blender (woo hoo!) and poured into a well-buttered frying pan. The eggs create a lofty, lovely puffed middle that crashes down into crisped, buttery edges and pockets of magic (there's that word again). Spiced with murmurs of cinnamon, nutmeg, cloves and ginger, this is the kind of breakfast called for when the snow flies and you want to stay in your pajamas all day, with just tea and a good book keeping you company. You might even wish to go back to the bed with the flannel sheets. It's November. You're allowed. Preheat oven to 400*F. Blend eggs in blender until pale. Add remaining ingredients except butter and process until smooth. Melt butter over high heat in a 9 inch ovenproof skillet. Be sure to swirl up the sides, or take a pastry brush and swirl butter up the sides. You want a nicely coated pan. Pour the batter into prepared skillet and bake for 15-20 minutes until golden and puffy. Slide onto a plate. Serve with powdered sugar, maple syrup and/or whipping cream. Serves 1 or 2. Recipe from The Smitten Kitchen Cookbook by Deb Perleman. That looks so stunning! I would love this! Can't wait to try something new for breakfast. Sounds delicious!! 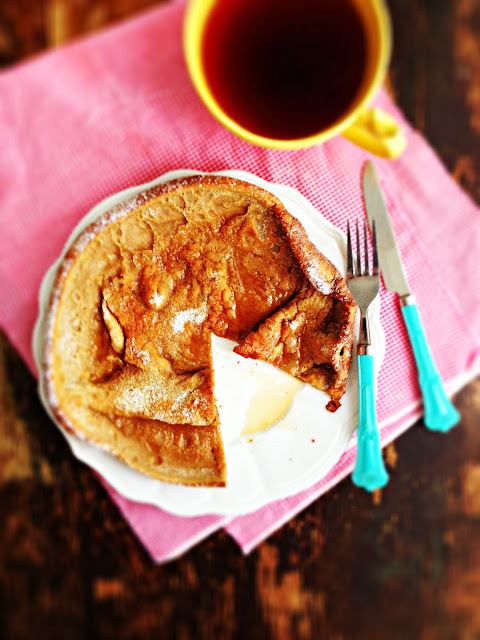 i would never have thought to make a gingerbread Dutch Baby, but now that you mention it it seems perfect. Oh, and wouldn't tart apples cooked with butter and maple syrup be divine on top! Saw this on your instagram and so glad you posted the recipe. 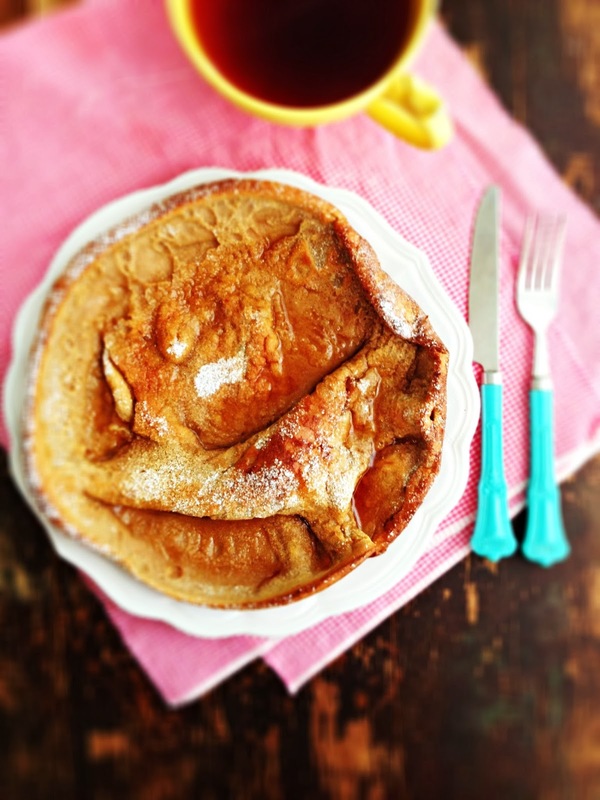 Always enjoy a Dutch baby and this one looks delicious! Val - It really is! Movita - I know, right? Anon - Great idea - I'm sure it would be great with apples too. This one looks very delicious. I would love to try this. Thank you so much for sharing.